How can I use topographic maps? Topographic maps show the three-dimensional shape of the landscape by representing equal elevation with lines on a two-dimensional map; they are in essence a type of contour map (also used in meteorology and oceanography). Although these can be mathematically derived, most geologists create them by measuring the elevation (and position) in the field (or on an aerial photo), plotting elevation on a map and connecting lines of equal elevation (much like connect-the-dots except that all the same numbers are connected, rather than in sequence). This module is designed to give you experience examining and reading topographic maps, understanding scale, calculating slope and drawing topographic profiles. Why should I become familiar with all aspects of topographic maps? Topographic maps will be familiar to those of you who are hikers or outdoor enthusiasts; they are used to understand the landscape over which you will hike (or rock climb or ski, etc). They are also commonly used by field geologists for a variety of applications. The ability to read and interpret topographic maps is considered a basic skill for all geoscientists and geoscience students. Topographic maps are used to understand the shape of the land, whether a slope will fail, how glaciers are changing, and geologic history, among many other things. Geoscientists make and use them to construct geologic maps, to find the best building sites, to estimate where flooding will take place, and to determine the best sites for archeological or paleontological digs. Parts of this module teach you about how to read topographic maps so that you can complete other applications that these types of contour maps are used for. Students of the geosciences who want to become proficient in reading topographic maps must also learn about scale - the relation of the size of the map to the size of the area in real life. Why should you care what the scale of the map is? The scale helps you understand how far you'll have to hike to get to that lake, or the distance between two points on a road. Parts of this module will take you through the types of scales, how to determine scale, and the standard types of scales for topographic maps. One of the most practical exercises found in geoscience textbooks involves calculating the slope of a hillside or other part of the ground surface. Why would you want to calculate the slope of a hillside? The slope can tell us whether this is a good site to build, whether a road will become covered with debris, or how difficult it will be to hike to that peak. It also influences volcanic hazards, limits permissible land use (such as farming and development), and much more. Parts of this module will walk you through how to calculate the slope of a hillside or groundwater table surface or anything for which you know the distance and difference in elevation. Drawing a topographic profile is related to slope and understanding the shape of the land. Why would you want to draw a profile of the landscape? Many geoscientists like to visualize the shape of the land as if they had sliced through it. This helps them to see hazards, draw conclusions about the strike and dip of the geology beneath the land, among other applications. Parts of this module will walk you through the steps to making a topographic profile, something geoscientists do often. Topographic map example. Click image for full size in new window. 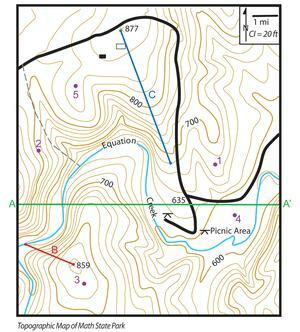 The following are examples of the types of questions that ask you to read elevations from a topographic map. Determine the elevations of points 1-5. What is the height of the hill where line B (red) is drawn? Show me examples of this type of question. The following are examples of types of questions that you might see in a typical question that asks you to plot points. Calculate the slope of line A (red) on the topographic map to the right. 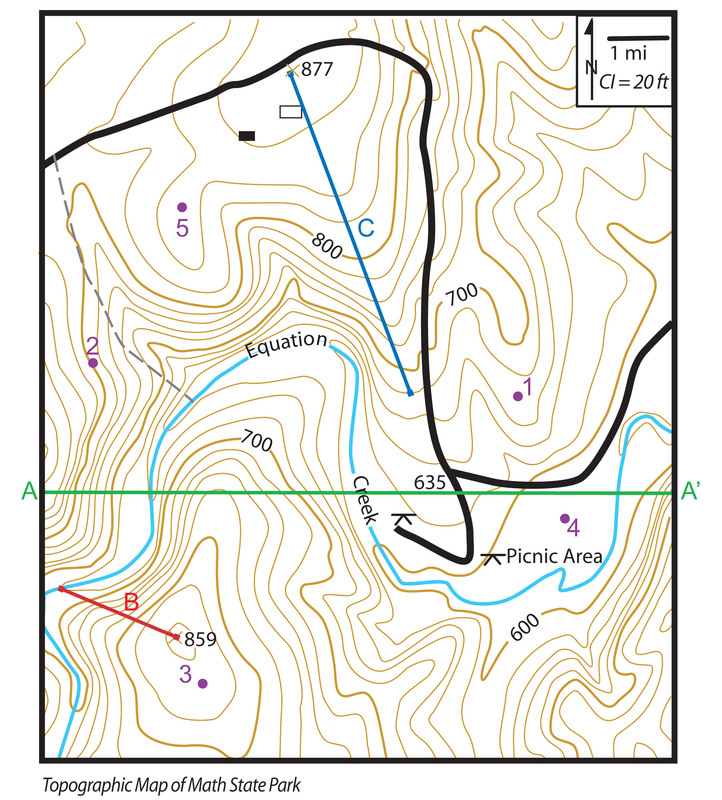 Determine which slope is steeper, line A (red) or line B (blue) on the topographic map to the right. Find the gradient of the road on the topographic map to the right. The following are examples of types of questions that you might see in a typical question that asks you to draw a smooth line. Plot elevations along the line A-B, connect the points with a smooth line to construct a topographic profile. Create a topographic profile across the summit of Mount Wenner. You can complete the pages linked above with no extra help. If you feel like you need more help, or more information about topographic maps , here are some links to help you think about topographic maps on the whole. Some basic instructions on reading topographic maps. Compassdude.com is a very basic introduction to topographic maps. An extensive, free, online book based on the US Army Field Manual: "Map Reading and Land Navigation" that includes many of the skills presented here, but also many others.